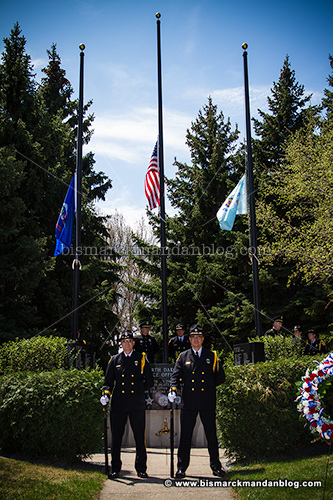 It’s been long overdue, so I’m posting few photos I took at the North Dakota Peace Officer Memorial Service back on May 15th. The memorial is located east of the Judicial Wing of the capitol, and the area is marked off and reserved for this service once a year. 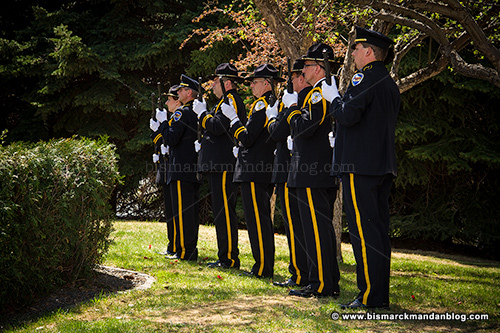 The honor guard stands by. Representatives from various law enforcement agencies around the state make up this team. 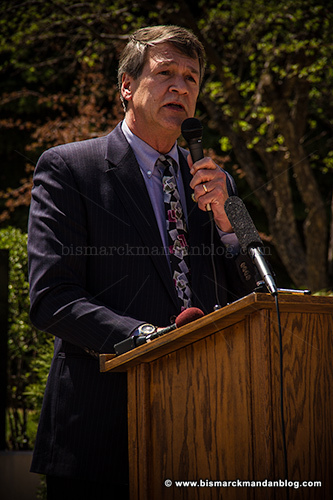 As Attorney General, Wayne Stenehjem is the state’s senior law enforcement official. Here he gives his remarks. Also speaking were Governor Dalrymple, Chief Justice Vandewalle, Chaplain Dan Sweeney, and Sheriff Pat Heinert. The flags returned to full-staff. 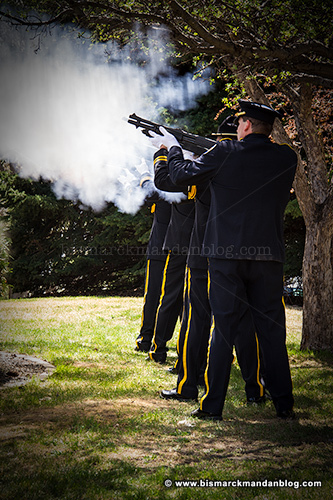 Salute by the honor guard. Very loud, very striking…and very challenging for a photographer, as the smoke of the first shot or two limits available chances for a photo. 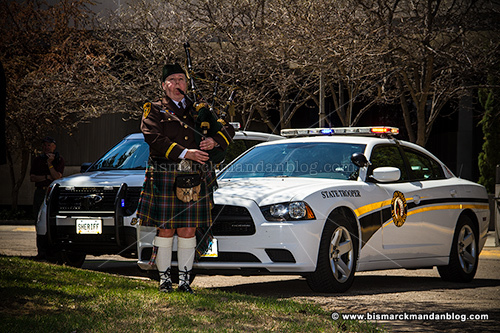 A hard hymn to listen to; the bagpipes have a certain connotation all their own that remind us why we’re present on this day. 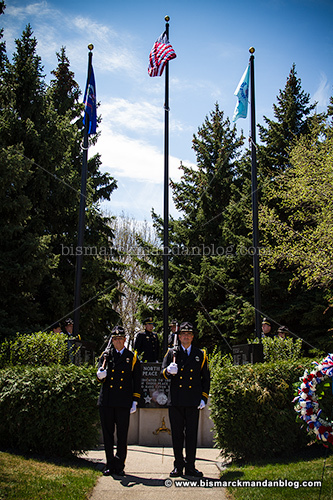 The wreath placed at the memorial at the conclusion of the service. 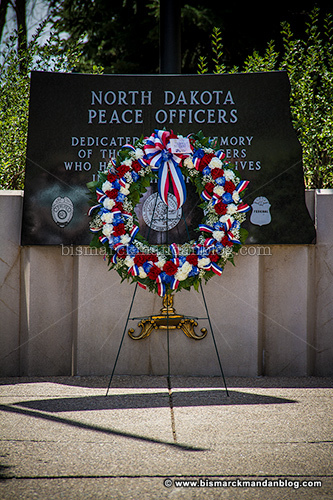 Thankfully this year there were no additional names to add to the wall; however, as a shameless cheerleader for local law enforcement, I know it’s still important to pause and reflect upon the risks our state’s officers take in the service of protecting their fellow North Dakotans. This entry was posted in Events, In Memoriam by Clint. Bookmark the permalink. 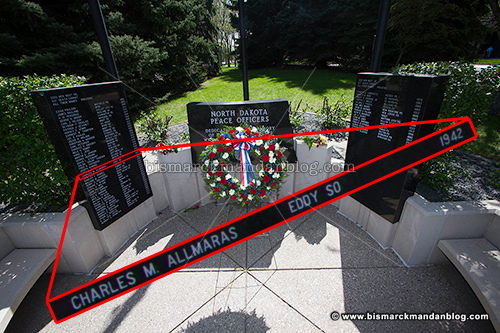 I was wondering why my Grandfather, Charles M Allmaras wasn’t recognized by the North Dakota Peace Officers Memorial. He was the Sheriff of New Rockford N.D., Eddy Co. 1940-42. He was shot and killed in the line of duty March 19th, 1942 leaving behind his wife and 8 children. What would it take to have his name inshrined on the Memorial. He is easily verified by something as simple as a phone call. Thank you, and all who have served and died in the line of duty to keep our great nation safe. He’s on the memorial. I looked at my photos of the memorial and saw his name listed.